Trellis Netting, also known as Pea Netting or Bean Netting, is a great way to increase crop yields. It is a clear, extruded polypropylene mesh with openings of 6″x 7″. The wide openings allow for easy access during harvesting. 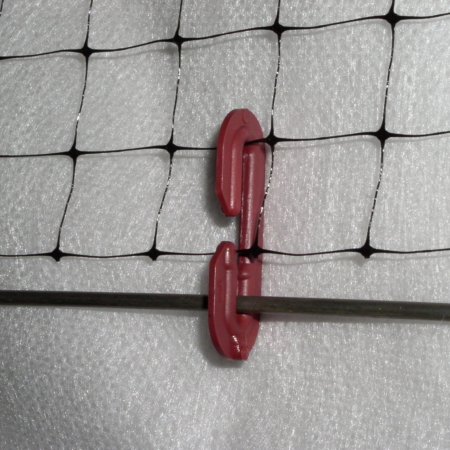 This netting is designed to provide both vertical and horizontal support, rated at 28 lbs per strand. UV stabilizers have been added to prevent degradation, giving this product a life expectancy averaging 5+ years. 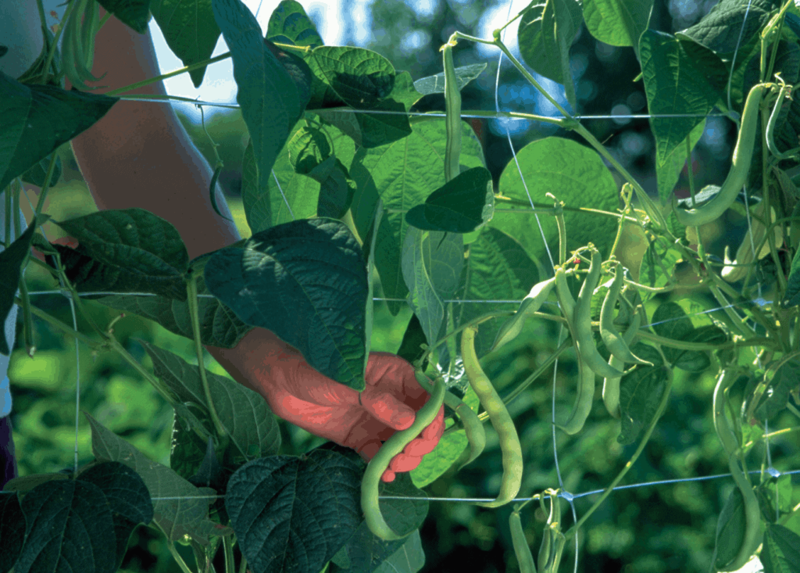 Using Trellis Netting can increase yield by up to double. 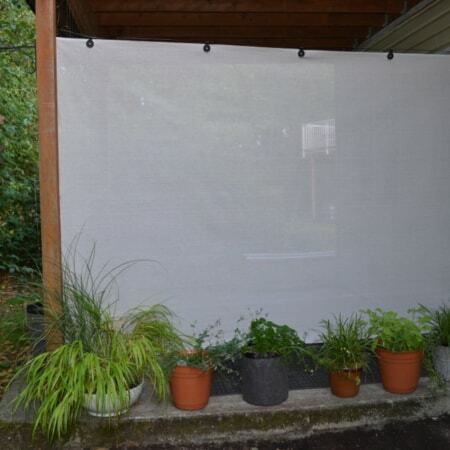 It does this by allowing for more sunlight and air exposure, while decreasing ground rot and pest damage. Our product is designed to limit tangling, making it simple to put up, take down, reuse or store. 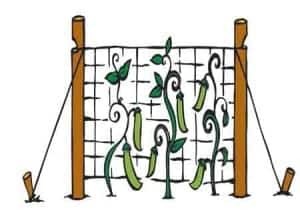 With its ability to support heavy crop loads, and being made from soft, non-burning material, Trellis Netting is designed to accommodate all kinds of plant life. 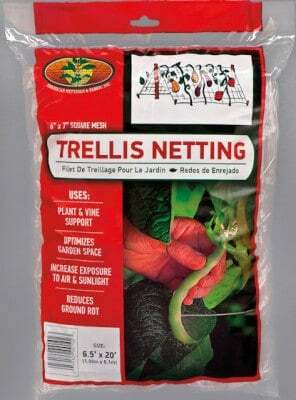 Trellis Netting are the same great product, just odd sizes or mild damage. Commonly referred to as Pea Netting or Bean Netting, this large, open, 6″x6″ mesh is also ideal for cucumbers, squashes, etc. Raises yields by increasing exposure to air and sunlight, thus reducing ground rot while optimizing garden space. Also ideal for ornamental climbers such as sweet peas, ivies, etc. Does not tangle like other large open mesh netting. Life expectancy of 5+ years. 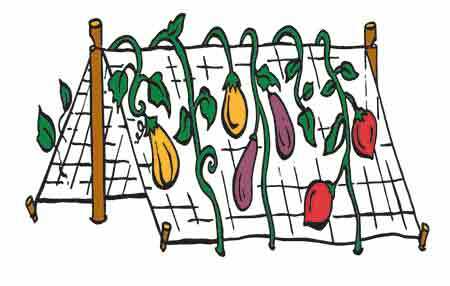 Trellis Netting is a great way to increase crop yields. The wide openings allow for easy access during harvesting. Trellis Netting increases yield by allowing for more sunlight and air exposure, while decreasing ground rot and pest damage. For suggestions and more information please see Product Description below. Climbing Vines, Beans, Peas etc. Secure sturdy poles at intervals, fasten one side of netting to the first pole with staples, nails or lacing (allow 4-6″ or 10-15cm clearance from the ground). Stretch netting to second pole and fasten. Continue procedure for additional poles. 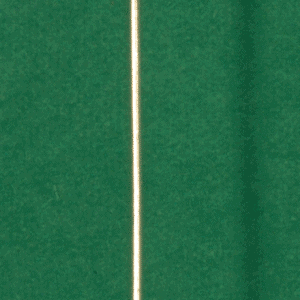 For maximum support, anchor poles to ground using our Poly Line, Anchor Stakes and Poly Line Tensioners. Stretch netting to second pole and fasten. Continue procedure for additional poles. For extra support, suspend netting from our Poly Line and anchor to ground using our Anchor Stakes and Poly Line Tensioners. 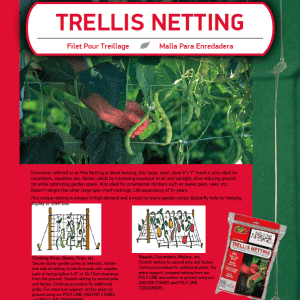 Please see Trellis Systems, Utility Netting and Garden Netting for products with similar applications. 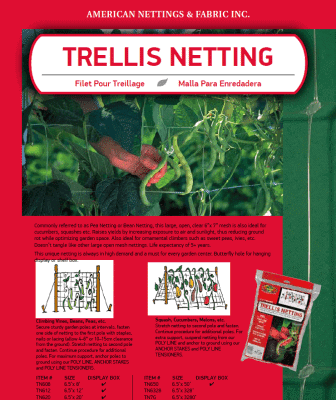 For discounted Trellis Netting, please see Trellis Netting.